BlephEx™ – One of 6 products to be shortlisted for the AOP Awards, Product of the Year! We are delighted to announce that BlephEx™ has been shortlisted by the AOP for Product of the Year. The AOP Awards celebrate extraordinary talent and outstanding contributions from across the Optical profession and industry. Since 2008, Scope Ophthalmics have been bringing dedicated, innovative and pioneering products to the ophthalmics space. “It’s very rewarding to be identified by the AOP as having successfully contributed to the treatment and management of ocular surface disease especially since the introduction of BlephEx™ to the UK market” Liadain Murphy, Product Manager. We are excited to attend the prestigious awards ceremony which for the first time, will take place at leading trade event '100% Optical', in London, on 5 February 2017. 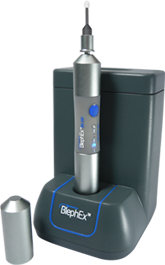 Visit us at stand L120 to get a demo of BlephEx™ in action and see for yourself how revolutionary this product is. Are you an AOP member? VOTE NOW: The winner of the AOP Awards Product of the Year 2017 will be decided by an exclusive AOP member vote. Vote for BlephEx™ by logging into your AOP account and selecting BlephEx™ under the product of the year category. For more information, please visit www.scopeophthalmics.com or freephone 0800 270 0253.